In philosophy a few weeks ago we discussed this idea by Fredrich Nietzche in The Greatest Weight. "This life as you live now live it and have lived it, you will have to live once more innumerable times more; and there will be nothing new in it but every pain and every joy and every thought and sigh and everything unutterably small or great in your life will return to you all in the same succession and sequence?" So basically the idea he's presenting is would you want to live your life over and over not being able to change a single thing. Would you? For me, that answer is no even though the past has brought me to where I am today. I wouldn't like to relive my life there's a lot of things I wish I could go back and change if I could. I feel like living my life over and over would be more of a punishment. The "lesson" is we should love our life so much that we jump to experience it all over again for eternity. It sounds semi-boring to live a life over and over again but I do see the premise behind the question. So this Monday Mantra is the opposite of what I explained however it has the same goal and meaning behind it. We should be living a life we wouldn't mind living over and we do that by living each day like it's our last and making it count. So I believe these two quotes are a contradiction but they go hand in hand. So what have you been doing to make every day count? 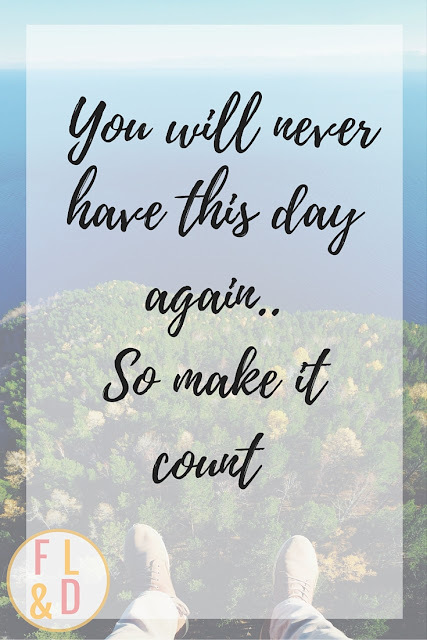 How are you going to make today a day you wouldn't mind reliving?